A strategy word game for the whole Family. 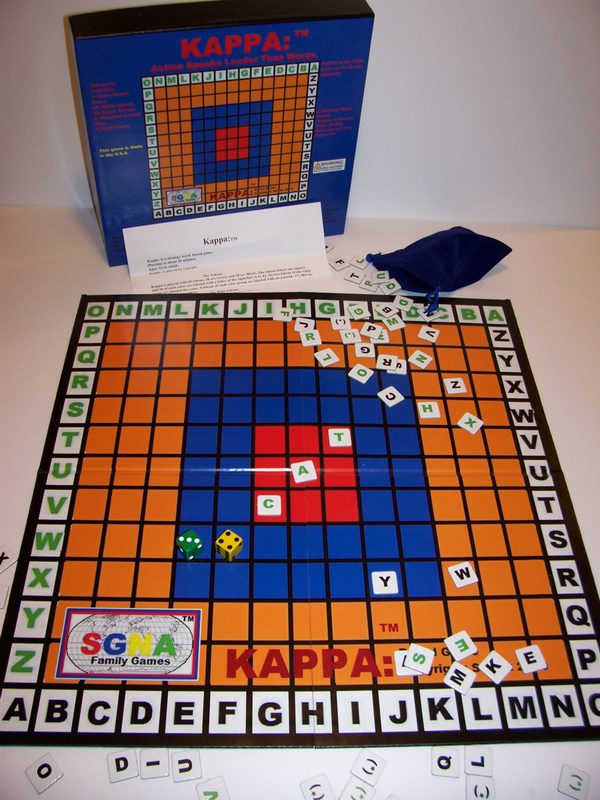 Kappa, is a strategy word board game. Playtime is about 20 minutes. Kappa is played by 2 people. 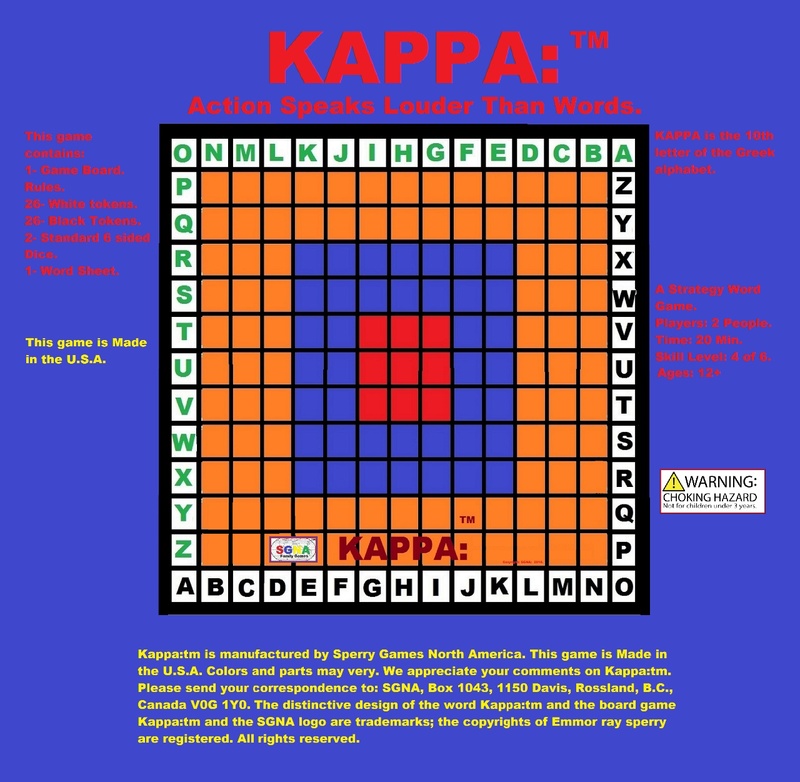 Kappa is played with 60 tokens, 30 are Green and 30 are Black, The tokens letters are square and 26 of each color are labeled with a letter of the alphabet [A to Z]. No two tokens of one color group are labeled the same. 4 tokens of each color group are labeled with an asterisk [*], this indicates a wild letter token. can get back in the playing field again as any letter, as per the rules. Kappa is played with two six side dice[standard dice] that are numbered 1 to 6 on their sides. The game Kappa supplies a sample word sheet that has a number of three letter words on it and a number of seven letter words on it and also ten letter words on it. used to make any part of a word. Then each player picks three words from the “Sample word sheet” or makes up three words of their own. One word is three letters long, like “DOG” one word is seven letters long like “ LETTERS” and one word is ten letters long like “REPRESENTS”. Each player then shows his words to the other player. The first player roles the dice and moves any letter token, of his group, he wishes, to try and make his three letter word at the center, Red grid. If a player rolls, for example an “eight” on the dice; he can then move eight squares. On this move the player can move one token 8 squares or two tokens, 3 and 5 squares or 8 tokens 1 square each or any combination of tokens, that add up to 8 squares moved on that turn. The second player rolls the dice and makes his move or moves. On any given turn or play, a player can move his tokens to try and make a word, but this player can also move to displace a token of his opponents, this may slow the opponent down or stop him from making his word. A “T” can displace the opponents “T” and an “M” displace an “M”, etc. Displacing is done when a player moves a token letter on to a square that is already occupied by the opponents token. The opponents token is then move back to its original position on the home square, on the perimeter of the game board if it is a wild letter token, it is removed from the board. Wild tokens can be used in the game at any time; but must come onto the playing field as a specific letter and they have to stay as that letter, unless displaced. Once a player makes his 3 letter word on the board, he points it out to his opponent, he can then start making his 7 letter word, when it is finished the player can start his 10 letter word. The tokens letters from the three letter word can be used to help make the seven letter word and the three and sevens can be used to help make the ten letter words, etc. The first player to finish his/her ten letter word, WINS the game.